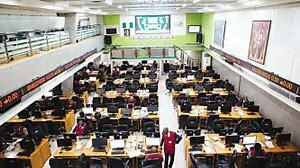 The Nigerian Stock Exchange (NSE) profited from a beehive of activities on its trading floor last week with market capitalisation appreciating by N334 billion following bargain hunting, despite political risks. Analysts who spoke with the News Agency of Nigeria (NAN) attributed the growth to positive sentiments ahead of 2018 earnings season and low interest rates in the United States of America. “Last week has been politically uneventful. This week’s performance will be mixed and will most likely close lower than last week on account of the polls,” Uwaleke said. Mr Ambrose Omordion, the Chief Operating Officer, InvestData Ltd., said foreign investors were taking position in the debt market and the equities market due to low interest yield in the United States. “Looking ahead, we continue to guide investors to trade cautiously amidst brewing political jitters ahead 2019 elections, and the absence of a positive market trigger. “However, we believe positive macroeconomic fundamentals will drive recovery post-election,” they said.